Five and a half years after 9/11, the WTC site and its surrounding streets are rumbling nonstop, with armies of workers laboring to finish site preparation and complex below-grade work. It will be more than a year before most of the key projects begin rising above grade. While the Port Authority of New York & New Jersey, MTA, NYC Department ofTransportation, and private interests such as Silverstein Properties and Brookfield Properties coordinate underground work involving tunneling, linking pedestrian passageways, and threading utilities through the catacombs beneath the site and the cityys streets, the architects behind the iconic projects continue to refine their designs. The process of design development and establishing construction schedules seems much clearer now that the LMDC is essentially out of the picture and the Port Authority has assumed control of the major WTC construction projectssa role it announced it would take last June and that was finalized on December 14. The Port Authority is overseeing the construction of the Memorial and Memorial Museum, the Freedom Tower, and the Transportation Hub. The agency is also producing Commercial Design Guidelines for private developments around the site, which should be released in the next few months. These guidelinesswhich are being produced with the help of Studio Daniel Libeskind and can be seen as a continuation of his work on the WTC Master Plannwill address issues such as massing, building heights, and street interface for commercial developments. The Port Authority is also in the process of contracting a consultant for streetscape design, following an RFP issued in December. The timing for these initiatives seems belated, given that the designs of the areaas most notable projectssincluding Silversteinns towers by Norman Foster, Richard Rogers, and Fumihiko Makii are well underway. With most of the projects looking at completion dates well beyond 2009, however, hopefully latee will prove better than never.. 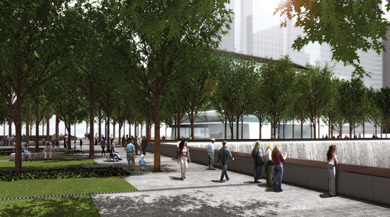 The WTC Memorialls beleaguered design process is close to clearing another obstacle: resolving the treatment of victimss names. In Michael Aradds original design, the victimss names were randomly arranged in a ribbon surrounding the twin pools, viewed from contemplative below-ground galleries that encircled the pools. Following Frank Sciamees June 2006 cost-saving recommendations that eliminated underground components of the memorial, designers were asked to propose ways of integrating the names with the above-ground pools. Another new design requirement, which was ratified by the WTC Memorial Foundation in early December, is the grouping of victimss names according to where and with whom they might have been during the attack. The designers are now exploring ways of integrating the names with the parapet surrounding the twin pools. Weere concerned with how to treat [the parapet] as not just a utilitarian object but as a contemplative one,,said Arad. Weere thinking about how a visitor approaches the edge of an enormous void, and how we can create an area of quiet reflection around it.. While he couldnnt offer specifics, Arad pointed out his desire for a parapet height that induces visitors to bow their heads, and a treatment of the inscriptions that allows visitors direct contact with names while discouraging behavior that might undermine the sacredness of the space. With the memorial raised to the plaza level, consulting landscape architect Peter Walker has been called upon to revise his park design..Now therees pressure on the areas around the pool to have a more spiritual quality,, he said. Hees reexamining the space behind the parapets, considering densifying the canopy of trees or other measures that will give people a greater sense of a private space,, he said. Walker is also studying the northeast corner of the plaza. The original design of the cultural center [by Snnhetta] provided an archway, which acted as a natural gateway into the park,, said Walker. Now the plaza itself must serve as a gateway, and our dilemma is how to create a meaningful sequence into a space thatts hallowed and quiet.. The Port Authority and Memorial Foundation expect to have design options for these memorial elements in the first quarter of this year. Also expected to be unveiled in the coming months is a revised design of the much smaller Snnhetta facility, which will now function only as the Memorial Museum and visitors center. 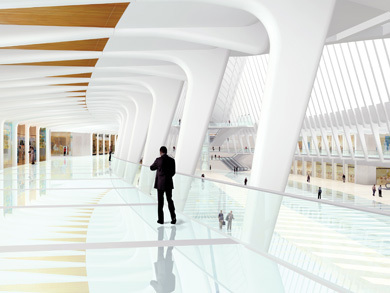 When Santiago Calatrava unveiled his design of the birdlike Transportation Hub in January 2004, the $2.2 billion project was heralded as an optimistic symbol for the rebirth of the WTC site. Located kitty-corner to the memorial plaza, the sculptural building has taken on new importance since the Snnhetta project was reprogrammed and no longer spans the northeast corner of the memorial plaza, anticipated to be the memorialls busiest entrance point. 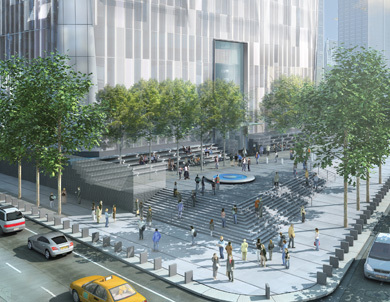 This change in plans opens the station to more space and sky, but has also presented a new dilemma: The northeast corner of the plaza will now serve as the prime gateway to the memorial, and must be designed to convey a dignified approach. The problem is, the plaza is also the roof of the underground stationns mezzanine area, which Calatrava designed to be lit with skylights. 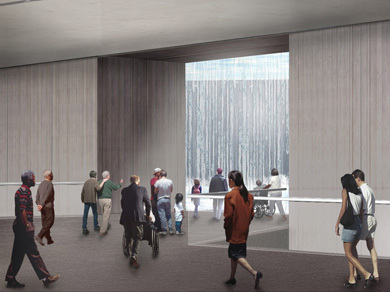 At present, he and landscape architect Peter Walker are working intently on a solution that will preserve the capacity for light to descend into the mezzanine while also ensuring that the space shapes an appropriate procession to the memorial itself. The Port Authority anticipates that design options will be presented in the next few months. Meanwhile, this month construction crews began work on a pedestrian concourse that will link the hub to the Winter Garden across West Street. Itts time for skeptics to put away their doubts. The 82- story, 2.6-million-squarefoot tower is indeed rising: Foundation work is essentially complete and on December 19, Governor George Pataki and Mayor Michael R. Bloomberg showed up to watch the first three 25-ton steel columns installed on the site. Theyyre the first of 27 extra-large steel columns that will line the perimeter of the tower base, to be in place by May. By the end of the year, more columns will brace the lower level and a second tier will bring steelwork to grade. Of course, design goes on until the last day because field conditions change,, said Childs, but basically the building will look like how we showed it in June.. At that time, the designers revealed that the 186-foot-tall, 200-by- 200-foot base would be clad in 13-foot-tall glass prisms. I wanted to make sure the facade would be as lively as possible,, he explained. At present, the designers are working with three different glass manufacturers to test a range of options. The glass might be cast, or rolled, or milled,, he said. We want an interesting texture and a reflectivity that will cast a multicolored spectrum of light..
Childs has brought on top collaborators, including Washington, D.C..based lighting designer Claude Engel, who worked with Norman Foster on the Reichstag project, and New Yorkkbased sculptor Kenneth Snelson, an innovator in tensegrity structures, who will advise on the design of the towerrs broadcast antenna. (The Port Authority is in the midst of negotiations with the Metropolitan Television Alliance over the antenna.) 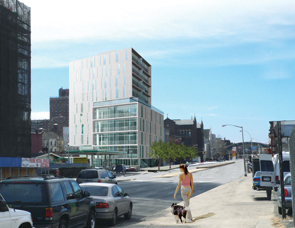 Childs is also working closely with landscape architect PeterWalker on the design of the towerrs surrounding grounds (terraced plaza at Vesey and West streets, pictured). The choice of Walker, who is also working on the memorial, was especially sensitive given that itts been left to individual designers to addresshoweach project relates to one another. As recently reported by William Neuman and David Dunlap in The New York Times ((Planners Clash Over Transit Hub, and Riders Win,, January 8, 2007), the Fulton Street Transit Center has overcome its latest hurdle, with theMTAagreeing to fund the difference between the $847 million in federal funds committed to the project and the current estimated cost of $888million.The funds secure the future of a passageway beneath Dey Street, leading to the WTC Transportation Hub one block west. The project, which will serve as a headhouse for a multitude of linessthe A, C, E, J,M,Z, R,W, 2, 3, 4, and 55 has had its share of hairy moments since it was commissioned to Grimshaw Architects in 2003. 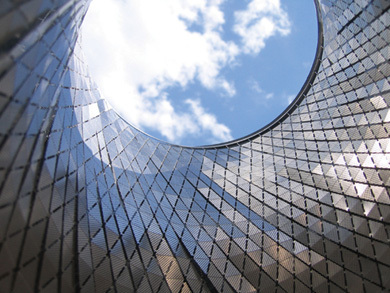 The initial design, a bulbous, glasssheathed steel cone, unveiled in May 2004 and budgeted at $750 million, had to be modified one year later due to budget problems: To build the center, the MTA had to acquire all the real estate on Broadway between Fulton and John streets, and no one anticipated real estate prices would skyrocket as they did. 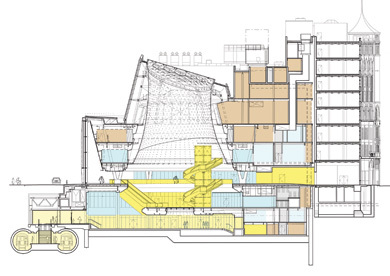 In spring 2006, the architects offered a scaled-back design that included the elimination of a sub-basement, the relocation of MTA offices to a ring around the domed atriummoccupying what principal Vincent Chang described as found spacee?and a reconceived dome. It was a different program, so we had to design a different building,, said Chang. Importantly, the new design preserves the architectss essential concepts: providing a strong civic icon as a response to the previously hidden, building-embedded subway entrances scattered in the area; bringing natural light and some of New Yorkks vibrant street quality to the stationns subterranean depths; and clarifying views within the station to aid in wayfinding. Performance and light were the conceptual drivers,, said Chang, explaining how their terms of analysis applied equally well to the new design. 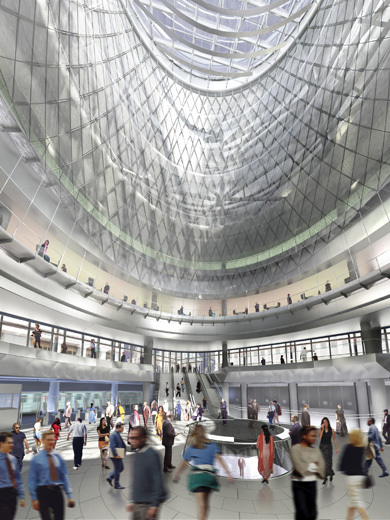 For the dome, which is not only slightly shorter but has lost its outward bulge, designers have decided on an elegant diamond cable-net (left, below) suspended from a steel ring that will form an oculus, outfitted with glass blades that will filter incoming light (left, above). From the projectts outset, the firm, in collaboration with James Carpenter, has been conducting extensive studies to predict the angle and nature of lightts reflection inside the cone and how it is redirected to the spaces below. The team is still finalizing the design of the facade of the rectangular glass pavilion, following requests last August from the NYPD for a more beefed-up perimeter to withstand blasts. (Chang assured that the amount of glass and transparency would remain the same.) Construction drawings will be finished in March, and a completion date is set for 2009. I was advised to find a pseudonym before writing Eavesdrop, and looked to the example of Charles Edouard Jeanneretts fabulously successful Le Corbusier or even Maria Louise Ciccone>s Madonna as the paragon of simplicity. Alas, my own name will have to suffice. With that said, letts hope the arcane world of architectural gossip, perhaps of interest only to a few, even in our own community, serves the purpose not only to bind our group together but also to humanize the increasingly faceless world of global architecture. Now, down to business: To recap Art Basel, the international art fair held in Miami Beach in early December, a number of New York architects were found Jet Blueing south, including Robert Stern, Walter Chatham, Gisue and Mojgan Hariri, Liz Diller and Ric Scofidio, Peter Marino, Lee Mindel, and Joseph Giovanni. Also seen were the Rizzoli honchos, the legendary editor David Morton and chief publisher Charles Miers, to lead the charge against their nemesis, Taschen, omnipresent at the art fair. 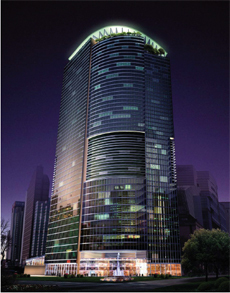 Zaha Hadid was ensconced at the Setai Hotel, in town to unveil a new furniture design for Established & Sons. Greg Lynn was on the same mission, and was seen during the weekend partying solo (sans wife Sylvia Lavin) at the Raleigh and the Surface magazine party on the rooftop of the Townhouse on the Beach. Heard at the fair that Ole Bouman, formely editor of the Dutch magazine Archis, was taking the position that Aaron Betsky, new director of the Cincinnati Art Museum, abdicated at the Netherlands Architecture Institute (NAi). Betsky appeared at the glamorous party sponsored by the Dutch Consulate, hosted by Robert Kloos and Jeanne Wikler, in honor of Li Eidelkoort, head of the famous Eindhoven Design Academy. The party was held at the apartment of yours truly, at Aqua, high above Indian Creek on the Beach. Among the many exhibitions during the Art Fair, one of the most smashing was French Modern Sources, an exhibition organized by the Georges Pompidou Art & Culture Foundation. Magnificent examples of original furniture by Chareau, Jean Prouvv, Robert Mallet-Stevens, and Le Corbusier as well as the original model of Rem Koolhaas> house in Bordeaux were displayed. Incidentally, Robert Rubin, who last year bought the extraordinary Maison de Verre by Pierre Chareau and Bernard Bijvoet, has revived the foundation, which was founded by Dominique de Menil but languished after her death. 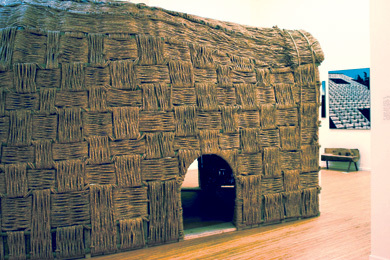 He donated to the foundation the prefabricated Maison Tropicale by Prouvv, which he rescued from Brazzaville, Congo, in 1997. The structure will be installed on the fifth-floor terrace of the Pompidou later this month. Also in Miami, albeit weeks after the fair was over, I had dinner with Michael Graves and Andres Duany and Elizabeth Plater-Zyberk at Yuca, a Cubanesque restaurant. Michael was zipping along Collins Avenue in his motorized wheelchair and can be happily reported to be in good spirits, clearly using his hands without problem. 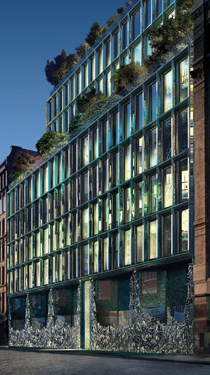 Closer to home (well, at least this writerrs home) is the cacophonous, daily, insistent pile-driving of Donald Trump>s 45-story SoHo projecttdespised by all, except perhaps its architect Gary Handel. Both of our offices overlook the site: For Gary the noise must be music to his ears. Meanwhile, we have powerful telescopes trained on the excavation, hoping to discover Native American bones to shut down the site permanently. Unfortunately, the discovery of remains of Episcopalians only delayed construction for a few days. I was advised to find a pseudonym before writing Eavesdrop, and looked to the example of Charles Edouard Jeanneret’s fabulously successful Le Corbusier or even Maria Louise Ciccone’s Madonna as the paragon of simplicity. Alas, my own name will have to suffice. With that said, let’s hope the arcane world of architectural gossip, perhaps of interest only to a few, even in our own community, serves the purpose not only to bind our group together but also to humanize the increasingly faceless world of global architecture. Among the many exhibitions during the Art Fair, one of the most smashing was French Modern Sources, an exhibition organized by the Georges Pompidou Art & Culture Foundation. Magnificent examples of original furniture by Chareau, Jean Prouvé, Robert Mallet-Stevens, and Le Corbusier as well as the original model of Rem Koolhaas’ house in Bordeaux were displayed. Incidentally, Robert Rubin, who last year bought the extraordinary Maison de Verre by Pierre Chareau and Bernard Bijvoet, has revived the foundation, which was founded by Dominique de Menil but languished after her death. He donated to the foundation the prefabricated Maison Tropicale by Prouvé, which he rescued from Brazzaville, Congo, in 1997. The structure will be installed on the fifth-floor terrace of the Pompidou later this month. Closer to home (well, at least this writer’s home) is the cacophonous, daily, insistent pile-driving of Donald Trump’s 45-story SoHo project—despised by all, except perhaps its architect Gary Handel. Both of our offices overlook the site: For Gary the noise must be music to his ears. Meanwhile, we have powerful telescopes trained on the excavation, hoping to discover Native American bones to shut down the site permanently. Unfortunately, the discovery of remains of Episcopalians only delayed construction for a few days. Mechanical engineering has come a long way since the end of the 18th century when industrialization introduced new building technologies and construction methods. Heating and ventilation became part of everyday building, but mechanical services were still seen as subservient to style and structure in architecture. Consequently, mechanical engineering remained somewhat behind the progress of architectural thought, and MEs were last to join the design team. Modernists changed this by declaring the new era of stylelesss architecture, and establishing a relationship between the aesthetic and the technical. Some architects searched for ways to give aesthetic expression to mechanical systemssmost notably Le Corbusier, who sculpturally exposed the roof ducts in the Unitt ddHabitation in Marseilles. Today, the way mechanical engineering affects the representational aspect of architecture varies from building to building, of course. But growing interest in sustainable designnwith many concepts derived from mechanical engineeringghas made the close collaboration between architects and mechanical engineers essential. In fact, for some projects, it seems that mechanical engineering technologies have become equal in importance to a projectts structural aspects, challenging the priorities of conventional architectural process. 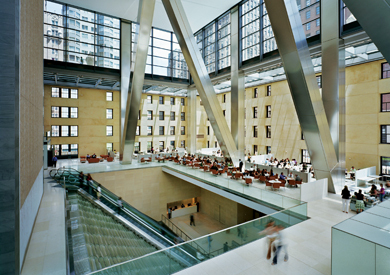 It has become more important to collaborate with mechanical engineers as early as possible in the design process,, said Robert Fox, a principal at Cook + Fox Architects, acknowledging the potential of MEs to strongly influence the design of a building..
On a high-performance and highly intensive infrastructure building such as One Bryant Park, the mechanical engineerrs role is absolutely critical to the success of the project,, agreed Serge Appel, a senior associate at Cook + Fox and project director for One Bryant Park. I cannt imagine a well-designed, high-performance building whose overall composition hasnnt been impacted by the mechanical criteria.. For example, for One Bryant Park, a 54-floor skyscraper thatts aiming for a LEED Platinum rating, the architects took the input of their MEs from Jaros Baum & Bolles (JB&B) early enough to be convinced of the value of an underfloor air systemma decision that, in turn, raised floor heights and provided opportunities for more flexible floorplans, affecting the way the architects planned interiors. Contemporary mechanical systems do impact the design of the buildinggnot necessarily how the building looks on the outside, but definitely its efficiency and its structural system,, explained David Cooper, managing director of Flack & Kurtz. MEs can help optimize all the functions of the building, if the collaboration with designers and other consultants starts early enough.. 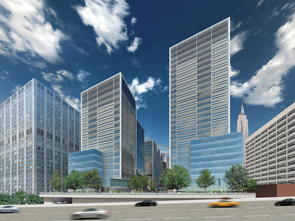 He cited the New York Times tower, which his firm worked on with the Renzo Piano Building Workshop and FXFowle Architects, as a great example of truly integrated space, where architecture, structural, and mechanical engineering become one.. For example, together with structural engineers from Thornton-Tomasetti, Flack & Kurtz helped architects develop a double-glazed curtain wall that ties into the buildinggs HVAC system. 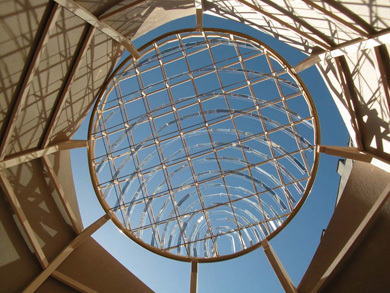 Air circulates between the layers of glazing, a cavity that also contains motorized shades. In a complex case like the New York Times tower, building information modeling is designed to bring this sort of dialogue to a new level. For Daniel Libeskindds Denver Art Museum, the extreme geometries made the full integration of mechanical and structural systems essential. By importing plans into a 3D structural model, Ove Arupps team from its Los Angeles office could successfully accommodate the complex blend of the buildinggs mechanical and structural elements. The improved communication that comes with information management systems like BIM can significantly reduce the number of requests of information (RFIs) between the design team and the contractors, and in some cases allows direct constructability, bypassing 2D drawings altogether. Another important development has been the extent to which mechanical engineers are engaging in computer simulations that allow them to test a buildinggs performance. Itts expensive to build mock-ups, so when we create complex spaces, computer simulations are extremely helpful,, said Cooper of Flack & Kurtz. 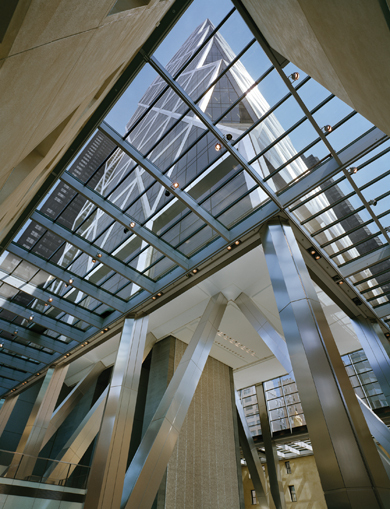 For example, for his firmms work on the Hearst Tower, they used computational fluid dynamics (CFD) to analyze indoor airflow, which they knew would be affected by the irregular angles of the structure. The future of design seems to be closely linked to BIM. Murat Karakas, a mechanical engineer at Arup who worked on the Denver Art Museum, certainly thinks so. We see a lot of potential not currently in place,, he said, suggesting that in future, the BIM model could serve as a user manual for building owners, So if a part fails ten years down the road, they will be able pinpoint the problem,, he said. While the improved integration of efficient mechanical systems is by no means dependent on 3D modeling technology, it can definitely ease the process. With 3D modeling, you get a better set of tinker toys,, said Lenny Zimmerman, another Flack & Kurtz mechanical engineer. Now, you donnt just draw what you are going to builddyou actually build it..
Masha Panteleyeva studied architecture at the cooper union and is an editorial intern at AN. help connect them to architects, designers, and builders. $75,000 grant. NYIRN also administers a City Councill funded program, the North Brooklyn Energy Grant, and recently allotted $50,000 toward Brooklyn-based Colonial Glasss purchase a cogeneration plant, which would remove its operations from the power grid. be applied on a heat-absorbing surface like cement for insulation, reducing energy costs. Globus also uses all water-based stains and adhesives, so its products do not produce harmful off-gases. 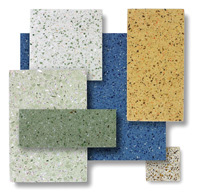 for flooring and construction. The company carries well-known products like Plyboo (plywood bamboo), as well as lesser-known sustainable alternatives such as Kirei board, an MDF-like sorghum grass composite made from the agricultural byproduct of sorghum harvests, and Dakota Burl, a sunflower-seed hull composite that looks like burled wood. Co-founder Bart Bettencourt has also started a furniture design business called Scrapile, which reuses locally reclaimed woods. When the Dia Art Foundation’s galleries at 548 West 22 Street closed in January 2004, it left a temporary void in New York’s cultural landscape, filled later that year with the promise of a new location connected to the proposed High Line Park. 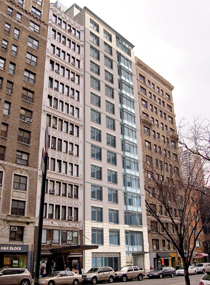 But on October 24, as reported in the New York Times, Kate Levin, commissioner of the Department of Cultural Affairs (DCA) received a letter from Dia’s new board chair, Nathalie de Gunzburg, announcing that the institution would not occupy the city-owned building at 820 Washington Street as intended. The announcement was followed by the surprising news that the Whitney Museum of American Art is considering the site as an alternative to expanding its Marcel Breuer–designed home on Madison Avenue. The Dia’s Gansevoort proposal matched the pioneering spirit the foundation embodied. Just as the museum settled in the then-burgeoning West Chelsea area in 1987, spurring its rise as an arts district, Dia would have created a stronghold for art in the transitioning Meatpacking District, and become a crucial part in the transformation of the High Line from an aging elevated railway into a dramatically landscaped public space. In February of this year, Dia’s director Michael Govan was hired away after a 12-year tenure to become director and CEO of the Los Angeles County Museum of Art. Shortly thereafter, Leonardo Riggio, chairman of Barnes & Noble, stepped down from Dia’s board after serving for eight years, thrusting the institution into a state of instability as both men were key leaders in Dia’s growth. While construction on the Meatpacking site had yet to begin, Dia had been working with Roger Duffy of Skidmore, Owings & Merrill (SOM) on the design of the 92,600-square-foot location. 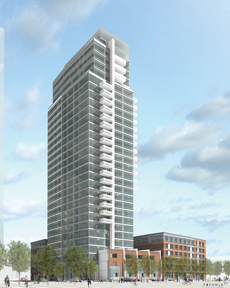 “It would have been a perfect project for the city,” Duffy said. “We worked closely with Ricardo Scofidio and James Corner [the masterplanners of the High Line] to make sure that the projects would interface well. I am a huge fan of Dia, and anyone who thinks highly of them is disappointed by the news. 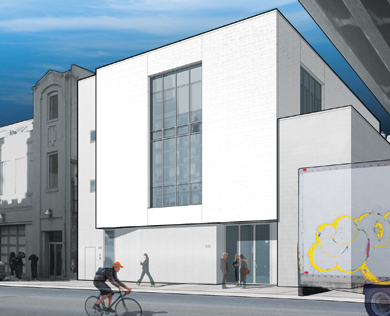 Despite the disappointment, City Planning Commissioner Amanda Burden seemed sure that another cultural institution will take over the space. 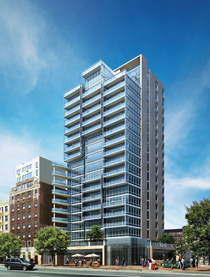 “A cultural use at 820 Washington is ideal for the southern terminus and principal entry to the High Line. The city will be actively seeking another cultural use,” Burden wrote by email. Whitney spokesperson Jan Rothschild declined to comment about the museum’s intentions at 820 Washington Street other than to reiterate that the Whitney is “keeping its expansion options open.” But, she added, “No matter what we do, we are committed to working with Renzo Piano, and he is committed to us.” In an interview with Newsweek on November 2, Piano said that in September the museum asked him to consider the notion of designing a new building on a downtown site, and brought him to 820 Washington Street. The Whitney’s attempts to expand its facilities spans 20 years, during which time it has hired and fired two architects—Michael Graves in 1985 and Rem Koolhaas in 2003—before hiring Renzo Piano to draw up plans in 2005. 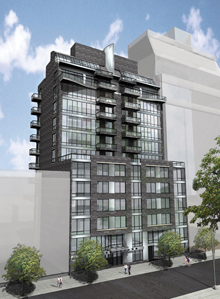 Piano’s initial plan met with stiff resistance from the community and the Landmarks Preservation Commission (LPC) but ultimately won all the necessary approvals and was granted several zoning variances in July from the city’s Board of Standards and Appeals. 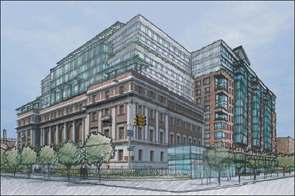 A new hurdle took shape when a coalition of Upper East Side neighbors filled suit against the museum in late August to contest the variances. Nine Million Stories in the Naked City? Demographers say that New York will grow by a million residents within the next 25 years, and Mayor Michael R. Bloomberg wants to plan for them. An as-yet unreleased report commissioned by Deputy Mayor Daniel Doctoroff makes some interesting recommendations—like decking over the Sunnyside yards and parts of the Brooklyn-Queens expressway—but doesn't get into the nitty gritty of who might actually pay for them. Is the report, Visions for New York City, really that, or is it a map for the next generation of developers? By William Menking and Anne Guiney. Photography by M. E. Smith. In his 2006 State of the City address, Mayor Michael R. Bloomberg promised to deliver a strategic land-use plan that would encompass housing, transportation, and infrastructure for all five boroughs, and would be closely tied to redevelopment initiatives already underway. For a city whose planning process has historically been decentralized, it was welcome news. Word of the report began circulating several months later, and this August, a copy appeared on the website Streetsblog.com. Visions for New York City: Housing in the Public Realm (which has not been officially released yet, and is therefore presumably still in draft form) covers much of what the mayor suggested it would, but comes from a different quarter than many expected: It was commissioned by Deputy Mayor Daniel Doctoroff and prepared by Alex Garvin & Associates for the New York City Economic Development Corporation (EDC). 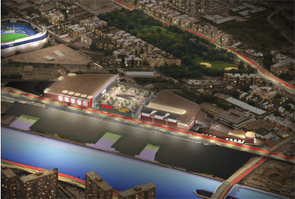 (The two worked very closely together on NYC2012, the bid to bring the Olympics to New York.) As it makes explicitly clear, Visions for New York City is not official policy, but when it is ultimately released, will nonetheless likely provide the framework for coming discussions about what New York will look like in 25 years, and how the city will get there. The introduction to Visions for New York City cites a projection from the Department of City Planning (DCP) that by 2030, New York City's existing population of over 8 million will exceed 9 million, if not sooner. It makes the reasonable argument that while the city's current economy is strong and has a well-planned infrastructure and a high quality of life, this cannot be ensured if growth happens in an unplanned fashion. The report thus makes a series of recommendations on where the city might house this population and how to improve its infrastructure. Visions for New York City is divided into two sections: Increasing the Housing Supply and Improving the Public Realm. The first, and more comprehensive, section essentially looks at what developers call soft sitess in all five boroughs, i.e., areas that are now either underutilized, such as neighborhoods zoned for industrial uses where little industry still occurs, or rail yards or highways which could be decked over and turned into blank development sites. Some of the many sites Garvin & Associates studied are the Sunnyside Yards in Queens, portions of the Bronx and Harlem Rivers in the Bronx, Staten Island's north shore, and the sunken section of the Brooklyn-Queens Expressway in Cobble Hill. The report further suggests that increasing mass transit into underserved areas will stimulate development. It also acknowledges the unlikelihood of securing major public investments to extend existing subway lines, and concedes that the creation of light rail or bus rapid transit systems is far more feasible. to 325,000 new residential units with virtually no residential displacement,, depending on how densely each site is zoned. Such a significant amount of new housing without any displacement is politically appealing, but of course there is a catch: The largest and most promising site is the Sunnyside Rail Yards in Queens, which would need to be decked over before it could be developed as housing. 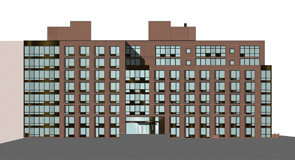 It is close to Manhattan, and if developed, would reconnect Astoria to Sunnyside Gardens, which, from an urban planning standpoint, would be an additional benefit. But at 166 acres, the very aspect that makes it so appealing —its size—is likely to make it politically and economically difficult to pull off. The site has been coveted for development since the Regional Plan Association's 1929 Regional Plan of New York and Its Environs proposed it as a place for an intermodal train station to relieve overcrowding in Manhattan. And while the Metropolitan Transit Authority owns the majority of the site, this summer, real estate attorney Michael Bailkin purchased a development option on part of it, which raises the financial stakes for anything that happens on the site. Without massive city subsidies, the cost of building such a large deck—the relatively diminutive 13-acre deck planned for Manhattan's Hudson Yards is estimated to cost $350 million—is likely to discourage anything but extremely high-density or luxury housing. According to Vishaan Chakrabarti, a senior vice president at The Related Companies who served for two years as the Manhattan director for the DCP, making some of that new housing affordable will be difficult. "The implication of the report is that all of the housing will be market-rate, but when you are talking about building housing on platforms, there are economic drivers that make [building any of it as affordable] difficult," Chakrabarti said. "We have not yet perfected the mechanism to harness market forces to build affordable housing, though it is not for a lack of trying." He added, "I was hoping to see something about this in the report." The Sunnyside Yards are not the only familiar item on the list of suggestions: as D. Grahame Shane, a professor of urban design at Columbia's Graduate School of Architecture, Planning, and Preservation (and a contributor to AN) said, "The list of development opportunities reads like a record of every university urban design studio for the last 15 years." That said, the report does represent an effort on the part of Mayor Bloomberg and Deputy Mayor Doctoroff to think spatially about the future of the city. This is something architects and planners have long hoped would be true of city politicians. 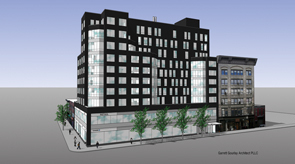 But Ronald Shiffman, a former City Planning Commissioner himself under Mayor David Dinkins and director of the Pratt Center for Community Development, nonetheless had reservations about Visions. "These same politicians are afraid to engage the public in a discussion to flesh out its finer points," said Shiffman. "They have come up with a proposal but don't discuss the social infrastructure: They don't say how this million new people will make a living. I'm glad that they are looking at it, but they also need to engage the broader community on other levels. This whole new population won't work in offices." This oversight on the part of the report has serious drawbacks, according to other observers. Laura Wolf-Powers, chair of Graduate Center for Planning and the Environment at the Pratt Institute, believes that Visions uses a narrow and shallow definition of the public realm, since it only discusses housing and to a lesser account some transportation issues. "There are many important quality of life issues that are not acknowledged in this report, like sanitation and waste water remediation facilities. Not only that," she added, "these uses are often located in the very manufacturing zones like those along the Bronx and Harlem Rivers that the report would give over entirely to housing." While these sites might be better used as housing, these functions must go somewhere. It's not news that manufacturers and industrial businesses that want to remain in the city are having trouble finding affordable space. The East Williamsburg Industrial Park, for example, which is home to over 2,500 small businesses, is facing residential encroachment from gentrifying sections of Williamsburg and Bushwick. 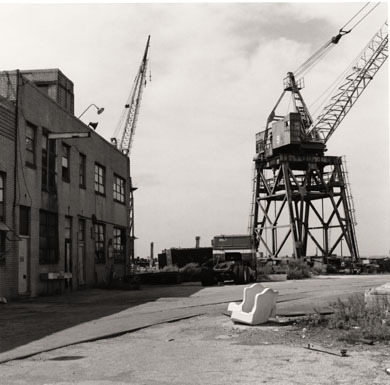 One of the areas cited in the report as worthy of future study is the Sunset Park waterfront, which is mostly industrial today and has been recently designated as an area that the city has committed to keeping that way. While Visions acknowledges the value of the area's current character and only recommends converting 90 acres of surface parking (operated by the Department of Small Businesses) into sites for development, it still proposes 27,400 new units of housing, which would undoubtedly put pressure on the area's industrial functions. Infrastructural capacity is a looming issue, said Chakrabarti, and one that cannot be ignored. Nor should it preclude the kinds of conversation that Visions will surely raise: "Energy capacity and wastewater treatment are real problems. We have capacity now, but not for another million people. Still, I don't think you can say, 'We don't have the infrastructure, so we can't fulfill the demand for housing.' It just means that housing will get more expensive." and did not come out of DCP is telling about the nature of its recommendations. There is an underlying assumption that public investment will allow for private sector development; the ultimate feasibility of finding these public monies is skated over. In the past, the city's planning reports have come out of the DCP, or people engaged with the Planning Commission—like Robert Wagner, Jr.'s 1984 New York Ascendant under Mayor Ed Koch—but Visions rarely mentions the DCP and any role it might play in planning for the future. (Doctoroff's office and the DCP both declined to comment for this article.) In fact, the report details a list of government agencies that must coordinate to make such far-reaching new policies work, like the EDC, the Department of Housing, Preservation and Development (HPD), the Department of Transportation, but goes on to suggest, "The Mayor's Office must delegate management for these projects, as doing so is integral to their execution and ultimate success." While some might see this as a cession of public authority, Chakrabarti points out that sometimes, outsiders can say things that City Hall cannot. "There are often conflicting goals in terms of what is good for the city as a whole and what an individual neighborhood may want, especially in regards to density," he said. "An outside consultant can make important suggestions that are politically difficult." One wonders if the secretive nature of the process, and its stress on the primacy of the private sector, is a product of Doctoroff's recent trouble with getting the West Side Stadium built, which was the sine qua non for bringing the Olympics to New York City. Several of the larger sites mentioned in Visions for New York City are on land that is at least partially owned by the state, not the city, which means that they are exempt from the Uniform Land Use Review Procedure (ULURP) and thus due much less public review. But the controversy and public acrimony surrounding Forest City Ratner's Atlantic Yards proposal—which also involves decking over infrastructure, public subsidy, and no ULURP—the now-defunct West Side Stadium project, and the World Trade Center site should suggest that proposals with only a nominal amount of involvement are no less immune to trouble than those which involve public input. When Visions is released, no doubt in a modified form, we hope that it is treated not as an identification of development sites across the city, but the starting point for a comprehensive and very public conversation about New York City's long-term needs. William Menking and Anne Guiney are editors at AN. ABOUT THE PHOTOGRAPHS: When photographer M. E. Smith noticed one day about 10 years ago that the subway station at the corner of Atlantic and Flatbush Avenues in Brooklyn had been torn down, he decided to start documenting the changes in the city around him. As the pace of development picks up and once-desolate areas fill with commerce and people, his photographs have inevitably taken on a documentary quality. A show of his work in and around New York was recently on view at Cooke Contemporary in Jersey City (see Functional Shift, AN 16_10.06.2006). The Biennale featured, in the Arsenale and various national pavilions, the works of many photographers known for their urban documentation, including Armin Linke, Gabriele Basilico, Edward Burtynksky, Antoni Muntadas, Bas Princen, and Sze-Tsung Leong. 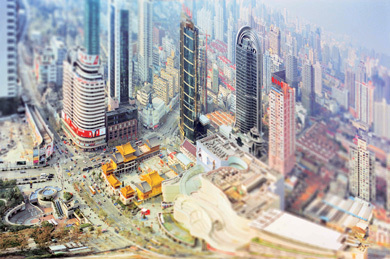 Italian photographer Olivo Barbieri's site specific_SHANGHAI 04 (2004), above, and Spanish photographer Dionisio Gonzalez Heliolopolis (2006), below, both appear in the mini-exhibition C on Cities, curated by the magazine C International Photo Magazine. Behind this year's Venice Architecture Biennale lurks a daunting moral imperative: Something must be done before the planet is overrun by urbanization. But whether architecture is the problem or the solution remains a serious doubt. The title of the show, Cities, Architecture, and Society, is peculiarly inaccurate in that the content of the major exhibition in the stadium-length Corderie of the Venice Arsenal is devoted to 16 urban regions of a size and complexity that can no longer be called cities. Any of them—London, Tokyo, New York, Mexico City, Mumbai, Shanghai—are made of a fusion of several cities around a historic core city, each comprising a sprawling megalopolis of millions of inhabitants in areas that are usually more than 50 kilometers in diameter. Aside from this linguistic anomaly, the main exhibition suffers from a more egregious absence: There is no architecture: that is, there are no memorable projects presented meaningfully through drawings, models, or photographs. The buildings and projects that are visible in an impressive series of films and photographs used in the show are furtive—always incidental to some greater reality. At first this lack of architecture strikes one as a pleasant surprise in an exhibition known for its incestuous relationships to star architects and its tendentious promotion of formal trends. But after 300 meters of being hounded by statistics and zenith views of cities, one starts to miss the company of celebrity authors and their trademark works, or at least some sense of a project for architecture. This year's director, Richard Burdett, professor at the London School of Economics and architectural advisor to the Mayor of London, aside from delegating the Golden Lion career award to his close friend Richard Rogers, has studiously avoided giving any notion of a criterion for architecture. Good intentions, however, are blazoned on the walls—sustainability and social justice—but they are not given any particular aesthetic agenda. Nor do the few specific examples, such as the transport system in Bogota, offer any notion of what can be done. An exemplary project for urban regeneration, for instance, Barcelona's 22@, a 200-hectare new town, is thrown in with hundreds of images and completely lost. Burdett's vision of the megalopolis, as he states, is of promising challenges, providing the opportunity to re-design the meanings, the functions, the aptitudes and the positive features of the various urban structures and strategies. But the display remains primarily analytical. The alarm over uncontrollable urban growth has been sounded frequently since the end of the 19th century, when Ebenezer Howard, reacting to the inhumane densities of London, the world's first boundless megalopolis, proposed the Garden City as a means of restoring the balance between city and nature. Two generations later Jose Lluis Sert published the modernist notions of decentralized urbanism in his 1942 tract Can Our Cities Survive? And more than 50 years back the most influential urban historian, Lewis Mumford, was constantly engaged in battles against sprawl and urban growth. The Dutch Pavilion directed by Aaron Betsky recuperates some of the bird's-eye-views of how Dutch architects confronted the question of urban crowding, using archival materials, such as H. P. Berlage's 1910 plan of South Amsterdam and the 1960s beehive scheme of Bijlmemeer. The Austrian Pavilion, curated by Wolf Prix, also recuperated historic exhibitions of urban utopias, including a recreation of Fredrick Kiesler's 1925 City in Space and Hans Hollein's 1964 malaprop collages of aircraft carriers in wheat fields. These historic works were in fact the closest thing to an architectural agenda in the Biennale. The only other truly inspiring exhibit from a formal point of view was Metro-polis, curated by Benedetto Gravagnuolo and Alessandro Mendini, devoted to the new subway system in Naples, a series of art-stations designed by well-known international architects and artists as varied as Dominique Perrault and Anish Kapoor. If the question of rampant urbanization is by now rather old, what's new about Burdett's analysis? Nothing, really, except the consideration of the ever-increasing dimensions of scale and the influence of digital technologies, which have resulted in the concept of flows. He promises that 75 percent of the world will live in urban situations by 2050, but since most of Europe and developed nations have already surpassed this measure, this fact does not seem so controversial. Uncontrollable urban growth is a vexing problem in terms of its environmental consequences, but this has not really yielded a show that provides convincing solutions; rather, it is a bit like walking through a geography textbook. There have been other recent exhibitions, such as MVRDV's traveling installation Metacity/Datatown (1999) and Rem Koolhaas and Stefano Boeri's Mutations: Harvard Project on the City at the Arc en Reve in Bordeaux (2000) that were more successful in creating a graphic method for appreciating the quantitative difference of the contemporary megalopolis. A surprising number of the national pavilions were devoted to what can be called everyday urbanism. The Australian Pavilion in fact uses the term specifically, the Belgian is devoted to the beauty of the ordinary, and those of the U.K., Hungary, Korea, and many others worked on the pervasiveness of vernacular and commercial landscapes, which in general excludes the work of architects. The Japanese eccentric Terunobu Fujimori was featured in his country's pavilion, offering a movement called ROJO (Roadway Observation Society). One had to remove their shoes to walk through the charred wooden walls into a room paved in tatami mats to look at the weird collection of things found on the roadside and the architect's arcane additions to these landscapes. The U.S. Pavilion was typically out of step. While the choice of the theme of Hurricane Katrina was a good one considering that most large urban agglomerations contend with a considerable degree of risk from disaster—a subject that has been beautifully investigated by Paul Virilio—the curatorial team of Architectural Record and Tulane University completely avoided the international scandal of the disaster in New Orleans, and the continuing scandal of governmental indifference. 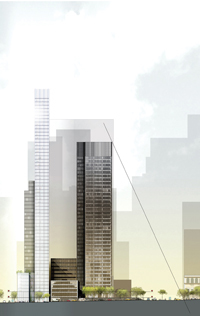 They simply offer some student project–like solutions on stilts that will never be built. The Spanish Pavilion was one of the most formally satisfying, and while it includes many fine urban projects, the focus is exclusively on the presence of women. It presents three dozen white boxes, each with a vertical video screen showing a woman from the waist up, speaking about urban questions. The curator, Manuel Blanco, somewhat like the filmmaker Pedro Almodovar, has produced an exclusively feminine version of a world dominated by men, presenting women who work as planners, politicians, artists, developers, taxi drivers, street vendors, and, of course, architects. 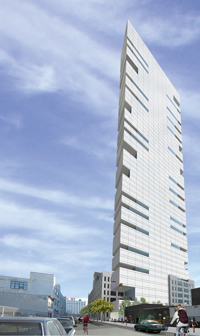 Architect Carme Pinos commented, "Everyone says how great I look in the video, but no one seems to have noticed my tower," referring to her recently finished the 20-floor Torre Cube in Guadalajara, Mexico. Her comment captures the spirit of this year's Biennale, which downplays the role of architecture. The French Pavilion is by far the most exuberant and popular, and perhaps best captures the overall atmosphere of this year's Biennale as cities without architecture.. Directed by architect Patrick Bouchain, it sprawls outside and over the top of its neoclassical porch, with deck chairs and card tables scattered about. Inside one finds scaffolds that shelter a bar, kitchen, and a workshop for artisans to make tee-shirts and other take-home items. 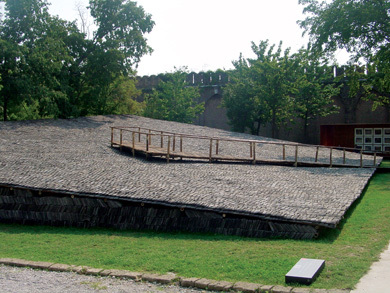 The structure also supports a stair for ascending to a roof terrace where visitors can enjoy a sauna, sundecks, and hammocks. A frolicking, hedonistic, and purposely messy affair, much in the spirit of Lucien Kroll, who was involved in its planning, this invasion of the existing structure makes a serious case for participatory design by adaptation rather than settling for the imposed formal order of architects. QuickBird satellite views of (from left to right) Milan, Barcelona, and Bogota. Similar views of all the cities under examination appear in the Corderie of the Arsenale. For over five hundred years, since Leon Battista Alberti, architects and urbanists formed a whole, working together in the making of cities. That is until the early 1970s, when architecture and planning went through The Big Divorce in American architecture schools. Among the reasons for the break-up was the drying up of publicly-funded support for urban revitalization programs. Urban issues were, largely, thrown out of architecture schools. Key figures left for schools of government and policy, geography departments, and such. As a result, for the past 30 years, architects and urban professionals stopped speaking to one another almost entirely. Now, Richard Burdett, director of the Cities Program at the London School of Economics and head of the itinerant Urban Age conference series, has, at the request of the Venice Architecture Biennale organizers, kick-started a dialogue between the two disciplines. In order to do so, he presented some of the grubbiest, grittiest, and dynamic cities in the world, including among others Istanbul, Shanghai, Caracas, Johannesburg, Mumbai, New York, Mexico City, and Sao Paulo. The concept behind the exhibition is exciting, with greater implications for the health of the planet and humanity than the latest architectural trends. No one has attempted a comparative study of the world's megacities on this scale before. The exhibition itself won't likely wow the general public, however. Panels of text, images, and charts filled with unprocessed information about the lower depths of urban reality is not the stuff of blockbusters. Among the show's shortcomings is the fact that issues like density and society are raised but are left hanging in the air. In the age of Google Earth, one might also wonder why more interactive media was not used. But what the show lacks in depth of coverage will presumably be supplemented by other activities throughout the next two months while the Biennale acts as a forum for debate and an incubator for policy brainstorming with a planned series of high-level workshops. Here, one supposes that issues like democratic rights, sustainable growth, local government versus World Bank–dictated rules of governance, and Hernando de Soto's brand of neoliberalism will be addressed. The theme of cities had a galvanizing, almost psychoanalytic effect on many national pavilions. At the U.S. Pavilion, Robert Ivy's team at Architectural Record along with Reed Kroloff of Tulane University grappled with the profound dysfunctionality of post-Katrina New Orleans and wound up with a statement of the inability of architecture alone, in spite of endless good will, to overcome certain political and social realities. The French Pavilion, perhaps as a form of expiation for the race riots that marked the nation's suburbs last year, was turned into one big pop-anarchist Rabelaisian bistro, celebrating togetherness in the midst of delicious food smells and plentiful wine. Austria fell back on two of its bluest chips, venerable masterpieces by once rebellious artists, one by Friedrich Kiesler of 1925 and one of 1964 by Hans Hollein. By contrast, the Hungarian Pavilion took a chance on an independently minded, youthful approach—examining the reach of Chinese-made goods in the world—and came up with a relevant contemporary statement on a specific urban reality. At the Russian Pavilion, the work of Alexander Brodsky, with his hilariously Gogolian black humor, offered a commentary on urban life in Russia today. The Spanish Pavilion was devoted to 52 of the most important women involved with architecture and urbanism in Spain. The overwhelmingly encouraged feminine presence goes a long way in explaining why this country has such great architecture and cities. Of all the countries, Great Britain was the most active in organizing real discussions. Paul Finch, the editor of Architectural Review, together with Odile Decq, Peter Cook, and Robert White of White Partners should be commended for presenting a series of public debates called The Dark Side Club, which took place every night during the vernissage from 10 p.m. until 2 a.m., after all the other parties had ended. And the British Council assembled a panel called My Kind of Town: Architecture and Urban Identity, featuring Rem Koolhaas, David Chipperfield, author Alain de Botton, Nick Johnson of visionary development firm Urban Splash, critic Alice Rawsthorn, and Sudhev Sandhu, author of London Calling: How Black and Asian Writers Imagined a City. Judging by the international attendance, these lively events might set a trend in future Biennales. Richard Rogers used the high-profile moment of winning this year's Biennale Golden Lion Award for Life Achievement to stress the need for strict government regulations, citing Portland, Oregon, as the most popular city in the U.S. because it is the best at regulating and containing sprawl and encouraging inner-city densification. Of all the speakers I heard, he was the one who got the most enthusiastic response. In the same vein, this Biennale brought the work of a generation of designers in their 40s to the fore, including James Corner of Field Operations in New York, Rahul Mehrotra of Mumbai, Yung Ho Chang of MIT and Beijing, and Jeremy Till from Sheffield, England, to whom architectural issues are not antithetical to urban, political, social, or ecological concerns. Top: The Austrian Pavilion, directed by Wolf D. Prix, features Hans Hollein's 1964 Flugzeugtrrger (aircraft carrier). The piece suggested how to install a complex urban structure in a rural setting, and also served as ironic commentary on the relationship between the city and nature. Middle: With the opening of the Italian Pavilion in the Tese delle Vergini (near the Arsenale), the old Italian Pavilion in the Giardini was given over to dozens of smaller exhibitions organized by various schools, countries, and research groups. The facade of the pavilion is wrapped in Olivo Barbieri's photograph of the Gonehexin Road overpass in Shanghai. 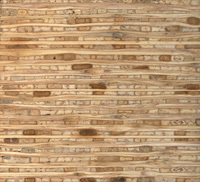 Bottom: The Japanese Pavilion is devoted to the work of Terunobu Fujimori, whose naturalist architecture features the use of charred wood, planted roofs, and rough stone and earth. Within this woven hut, installed in the pavilion, visitors could watch a slideshow of images taken by ROJO, the Roadway Observation Society, founded in 1986 by a group of artists, including Fujimori, dedicated to documenting extraordinary roadside phenomena. The Biennale is basically a provocation from director Ricky Burdett to architects and planners. Why do architects not have a role in the forming of cities, why are we not involved more, or voicing opinions more? Why do we have such a lame role in civic discourse? Planners always seem to have good ideas, but they do not follow through. If they did we would not witness the degree of dystopia displayed at this Biennale. Planners do not have power, they are disengaged with physical reality; instead they seem to be buried in paper statistics. With the war in Iraq, the threat of terrorism, poverty, starvation, and genocide erupting around us, how do we answer the questions posed by the exhibition's organizers: Can planning promote social cohesion? Can good governance improve things? Do we all answer "yes" and go and have a Bellini? This is when the 1970s come to mind: Back then, we went into action more directly and architecture's sense of purpose ran deeper. The Spanish Pavilion, curated, designed, and organized by the perfectionist super-phenom Manuel Blanco, is the individuated and collective voice of women in Spain from all walks of life: female vox populi. It is a very clear, powerful, and credible message. Women are animated, beautiful, sympathetic, and most of all humane. Manuel says his approach was obvious since Spain has a feminine prefix, yet female voices have been suppressed by strong male dominance in politics and culture. The Irish have the most to show in terms of their efforts to balance Ireland's fast economic growth, ecology, large planning efforts, and sustainability. It is unfortunate that their room, in the old Italian Pavilion, is painted black, since their projects are realistic and send a positive message about the robust engagement of politicians, planners, and architects to make the semblance of utopian future possible. The relationship and balance between the obvious and visible architectural quotient of a city versus the support fabric of its infrastructure is the point of this Biennale. I was not so worried that there was not enough architecture. A lack of buildings does not mean architecture is absent. There is a territory where architects can take over creatively, as is demonstrated by the Irish group show, which is filled with strong case studies. There was a lot of dialogue and discussion going on during the vernissage, but one looming question was: Where were the Americans? The U.S. Pavilion sent a strong impression of the effects of Hurricane Katrina. The intricate moving model of cubes suspended by fragile strings is a metaphor for New Orleans housing as a puppet of mechanized bureaucracy. Once these strings are cut, the cubes float aimlessly without life support (full disclosure: this is the work of GSD students). And yet Americans had a weak (if any) presence in the public discussions organized by the Biennale. It made me realize that not only is the U.S. isolating itself in foreign policy, but we may be in danger of isolating ourselves in the area of urbanism too. What can we learn from others, what can we share? Are we engaged in this global discourse? If so, we should certainly be able to have several alternatives and viable models other than New Urbanism. 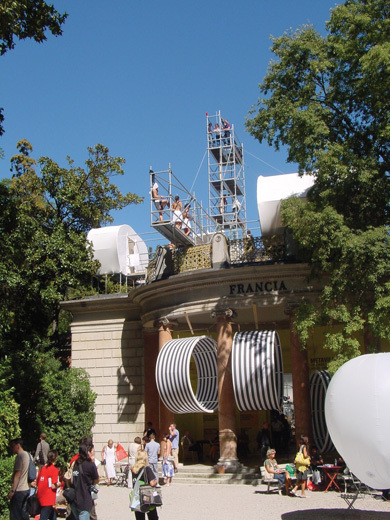 The French Pavilion has become temporary home to two dozen artists and designers, who have outfitted the neoclassical building with bunk beds, a kitchen, bar, DJ stand, rooftop sauna, and sundeck. Top: The Austrian Pavilion, directed by Wolf D. Prix, features Hans Hollein's 1964 Flugzeugtrager (aircraft carrier). The piece suggested how to install a complex urban structure in a rural setting, and also served as ironic commentary on the relationship between the city and nature. Middle: Their Tiles Garden is made over 60,000 tiles recycled from demolished structures in Hangzhou. 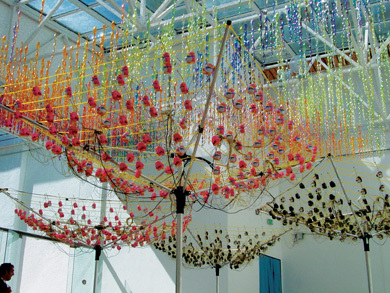 Bottom: The Hungarian Pavilion made use of cheap, Chinese-made plastic goods to create animated canopies, wall-hangings, and other installations. 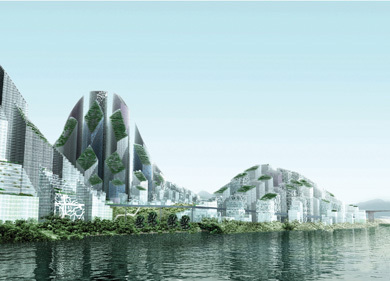 The Danish Pavilion proposed various projects for sustainable development in China, including Magic Mountains, a green business district. The End of the Line for the Biennale? Despite the importance of the subject matter and the high seri- ousness with which it has been approached, this Biennale, for me, does not work as an exhibition. The long, long gloomy columnar promenade of the Corderie in the Arsenal complex—in recent years the heart of the show, crammed with goodies—has never been sparser. You feel you are attending a stern lecture. Only the lecturer is absent, and has sent along his notes instead. The rest of the show, over in the pocket garden suburb of national pavilions and scattered here and there throughout the city, is as patchy as ever though one finds intermittent flashes of joy. But it is difficult to imagine where this exhibition can go from here. The last good one with a strong theme was curated six years ago by Massimiliano Fuksas, Less Aesthetics, More Ethics. That allowed plenty of provocative architecture, but it also required an analysis of the social dimension. And now? The architecture biennales are always rather touch-and-go. The go button is always pushed late: It is always a scrabble to get it together in time. This one feels like the end of an era. If the series is to continue, it must be comprehensively re-thought. It must have a reason to exist. 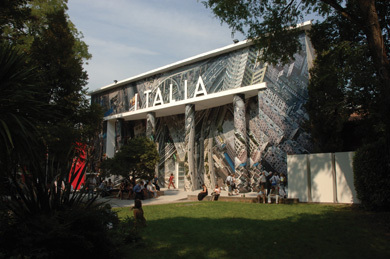 As far as I am concerned, the best room was the central space at the Italian Pavilion, where the imaginative power proper to art and architecture were used to confront, criticize, and speculate on the city as a reality, rather than reduce it to facts and figures. For sheer scale, the AMO layout, an aerial panorama of the whole Gulf coast, from Kuwait to Saudi Arabia, could not be matched. And of course in our historical exhibition [at the Dutch pavilion] we tried to bring up the issue of the city as a real place for which we have to take responsibility as architects, not just as concerned citizens. For the same reason I appreciated the attempts by the Russians, the French, and the Hungarians to make this point in an imaginative way. And that would lead to my major gripe: Just as architects should not pretend to be graphic designers or landscape architects, nor should they claim to be sociologists or politicians. Positioning your work within a social and political field is one thing; claiming to be Al Gore is another. The imagination was buried too deep beneath the pavement of Venice this year to be unearthed by any statistical tools. The Venice Biennale is, as always, worth it, even though the overall lack of normall architectural scale—meaning models, drawings, reference to neighborhoods—made this year for a rollercoaster between the elegantly cold and the sometimes overdone touchy-feely. The show at the Arsenale belongs in the former category. Director Richard Burdett's momentous analysis of 16 great cities was impeccably presented in an installation designed by Aldo Cibic and his partners. The installation had some beautiful moments, some planned—the room comparing densities, for instance, filled with self-explanatory beautiful styrofoam stalagmites, or the views of the cities flowing under your feet in small connecting bridges—and some serendipitous: in the Caracas corner, an oil stain in the floor that ghostly mimicked the shape of the city hung on the wall just above. The deeper you went into the Arsenale, the more you could get lost in data, comparative studies, and gorgeous satellite pictures, but somehow you longed for people and buildings. The pavilions were very uneven. One wonders why some nations don't just stay home, or rent out their pavilions to the other countries that might really have something to say. Among the interesting ones: the Spanish, curated by Manuel Blanco, my favorite, with women of all walks of life talking about their cities, with architecture a part of their soundtrack. The British, taking the city of Sheffield as a case study and exploring it at different scales, from sheep to satellite view. The Japanese were a bit out of theme, but soothing and beautiful. The Slovenian: at last some innovative architecture. The French overshared—do we really need to see guys cooking in a pareo?—but were a hit because they were very hospitable, to the point where otherwise respectable architects were hopping the fence to join their late-night parties and the police were called nightly to kill the fun. Personally, I learned to blog. Together with London's Architecture Foundation, MoMA launched a wild beast of a blog that became quite the recipient of everybody's rants and raves (www.venicesuperblog.net). When we try to describe a city, we often start by quantifying its inhabitants, expressing through its size what typology of city we are speaking about: small, middle, large, or extra-large. The presentations of the 16 megalopolises in the Arsenale strive to analyze the phenomena of how they came to be. But never could a collection of quantified facts express what a city is. Architects are dedicated to thinking about and organizing people and life; architecture exhibitions are dedicated to vicarious representations that are free of the noise and smell of flesh-and-blood cities. This Biennial takes a non-risky position, avoiding experiments on concrete strategies. It is a pity for the general public and the thousand of young future architects, desperate for inspiration for visions of tomorrow. Richard Burdett's exhibition begins with a description of cities in a changing world and ends with an invitation to cities to change the world. At critical junctures, displays focus on issues such as income disparity, density, mobility, and information flows. Implied throughout are the issues of class and race, which underlie many of the disparities the exhibition highlights. The individual city presentations varied in quality. New York's presentation (coordinated by Pamela Puchalski of the Center for Architecture) successfully captured several of the city's innovative planning and development initiatives such as the High Line park and the effort to build more housing along the city's waterfront. Given the city's penchant to diminish its mandated participatory planning processes by surrendering its decision-making role to the state, as they have in the case of Forest City Ratner's Atlantic Yards proposal, I was surprised to read in the exhibition text that New York has decided to accommodate growth by capitalizing on its edges along the water, investing heavily in new housing projects in the outer boroughs, and involving its citizens in the debate on the future of the city. One wishes it were really so. Too little investment and far too little debate. Perhaps New York City should borrow from the Norwegian city of Tromss, which decided to call a time-out on large-scale development and engage its citizens in what is truly a public debate. After the painful, but visually enticing, onslaught of Burdettian data, statistics, and images of cities on the verge, perhaps the upcoming Venice Art Biennale will follow suit by filling the Corderie and Giardini Pavilions with the financial statements of artists, galleries, and museums (leaving out the art). Now that could actually be interesting! In 1933 CIAM studied 34 world cities in aerial overviews and statistical analyses aboard the S.S. Patris while cruising between Marseille and Athens. The result, the Athens Charter, published in 1943, was the lingua franca of postwar modernism's bid to take charge of the city through functionalist and universalist criteria. It was hard not to think how far we are from this venture of over 70 years ago, arriving by air in one of Europe's prime museum cities, Venice, to take in Richard Burdett's ambitious marshalling of aerial views and statistics comparing 16 cities on five continents. If the pious list of five recommendations at the show's conclusion had more to do with issues of city governance—even in a display largely devoid of analysis of the vastly different historical and political forces at play—the results displayed could not have been further from CIAM's taking hold of the reins through design. The Biennale was filled with small-scale interventions in the impoverished quarters of the Third World and landscape re-workings of the detritus of the industrial past in the cities of the First World. The shrinking city of Berlin, where capitalism and democratic political process has eclipsed Europe's communist past, were lumped together with Shanghai and with Mumbai, the latter earmarked soon to overtake Tokyo as the largest city in the history of civilization. Caracas, presented neutrally as yet another booming metropolis, with little acknowledgment of the distinct political and economic situation of the petroleum capital with its populist anti-imperialist leader (a not so subtle protest is registered in the Venezuela Pavilion where the sole exhibition objects are a grainy aerial photograph and a broadsheet declaring a complete lack of interest in any Westernn-imposed urban solutions). As the exhibition embraces the notion of a globalized crisis—with many of the virtues and problems of Al Gore's An Inconvenient Truth—the particularity of each city begs for attention. Projects were modest and isolated, except for large-scale planning sponsored by developers, who increasingly have turned to star architects. What could have underscored how omnipresent a very different urban condition in 2006 is than the looming mass of the Norwegian Jewel cruise ship, whose towering 15 decks threw the national pavilions at the Giardini in shadow during much of the preview. None of the tourists disgorged was clamoring for entry to the Biennale, even if the morning Gazettino di Venezia featured both the influx of international architects and a photo reportage on the visible erosion everywhere of Venice's fragile brick and stone fabric caused by the ever-increasing traffic of super tourist liners in the lagoon. The Italian Pavilion curated by Franco Purini presents the design of Vema, a theoretical city for 30,000 residents located between Verona and Mantua. Contained within an area measuring 3,720 by 2,300 meters, the city is divided into sectors designed by 20 groups of architects under 40, chosen from among the most promising young practices in Italy. The immense model of Vema, which dominates the exhibition space, can be appreciated on two levels. For the general public, Purini's project will seem to go against the grain: The creation of a newly founded city in a Western country, so similar to the Renaissance examples of Sabbioneta and Palmanova, is in clear opposition to the dominant urban model of sprawling metropolis or the Koolhaasian Generic City. 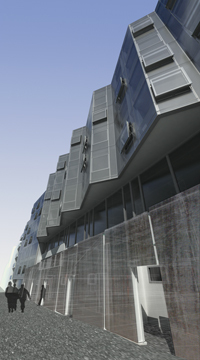 What makes Vema contemporary are the projects designed by young architects. The result is thus a strange hybrid in which the ideal cities of Filarete and Vignola coexist with deconstructivist, super-modern, and neo-organic projects. For insiders, Purini's project is an attempt, as brilliant as it is unconvincing, to reduce the tension between young, experimental architects and the old guard, of which Purini himself is a leading exponent. The video that accompanies the exhibition thus presents a picture of Italian architecture as a continuum, where the old and new coexist without conflict, and wherein we are able to overcome the violent clashes that have historically occurred, for example, between figures such as Manfredo Tafuri and Bruno Zevi, and gain inspiration from models as diverse as the baroque Paolo Portoghesi and the radical Archizoom. Below is an excerpt of architectural theorist Beatriz Colomina's video observation included in the exhibition Espana [f.] nosotros, las ciudades (Spain [f.] we, the cities) at the Spanish pavilion, curated by Manuel Blanco. Hers was one of 52 recordings of Spanish women—clients, architects, citizens—speaking about their experiences of particular buildings or of urban life in general. What interests me most about cities is how they are so radically transformed with each new technology, from gas lamps to trains to electricity to video cameras. Lately I have become interested in cell phones. No technology has transformed the city more than cell phones in a long time. They have completely revolutionized the relationship between public and private. To be in a city you no longer have to be in the street—you can join a friend in a cafe simply by calling—and if you are in the streets you may not be in the city, as when you are so immersed in a conversation that you are somewhere else and the streets you are walking become a kind of mirage. In fact, in almost any city today there are more people on the phone than in the streets. Every aspect of our experience has changed. This became evident on September 11 when any traditional sense of public and private space became obsolete. In the heart of the spectacular nightmare, covered continuously by every single television channel, the most intimate exchanges were taking place. For the first time in the history of a catastrophe, the families and loved ones of many of the victims were among the first to know when they received cell-phone calls made from hijacked airplanes and from inside the World Trade Center towers. These calls carved out a whole new sense of space, a last vestige of domesticity. In the aftermath of the events, the desperate attempts on the part of cell-phone companies to deliver the last messages that had not gone through attested to the importance of this form of communication. In a situation in which there were very few human remains recovered, those messages were all that was left, the very thing that is always missing in tragic accidents. No longer simply a fragile substitute for real people, the digital record became the most solid reality. There was a new sense of space constructed by the unrelenting bombardment of repetitive images through TV and the Internet and the simultaneous exchange of the most intimate and unique, one-on-one communications via cell phones. If 9/11 in New York revealed the cell-phone as the last vestige of domesticity, 3/11 in Madrid revealed the cell-phone as a weapon, triggering the train bombs. Personal defense became public attack. The theme of the 10th International Architecture Biennale is key for the architecture of the next decades. Thus I find that though the main exhibition at the Arsenale displays a striking collection of different factors and important data, it fails in developing a theory or visions out of this information. On the other hand, the shows at the national pavilions in the Giardini present, with a few exceptions, the helplessness of architects in association with strategic city models. Walking through the Arsenale, one would hardly know there was a difference between Bogota and New York. In fact it seems that Cairo is denser than New York, therefore...exactly—so what? The quality of the characteristics that make a difference between cities is leveled in this show by categories that have nothing to do with living in each place, such as stock market capitalization or the ranking of their commodity exchanges. Most of the cities appear to have been selected for politically correct purposes: one from continent A, one from continent B, and who knows why so many from South America? The show also suffers from extreme Google Earth–mania, an obsessive fascination with those satellite maps that are now available to everyone. But who experiences a city at 250 miles up in outer space? In the end, the whole show should have been about New York—Manhattan, to be precise—in an attempt to understand why it is clearly the most exciting city on earth and the present-day capital of the world—I love New York! China crops up often in the Biennale, which perhaps should not be surprising given its dizzying rate of urbanization and the extent to which its rapid development has affected global architectural and construction practices, not to mention the world's ecological balance. 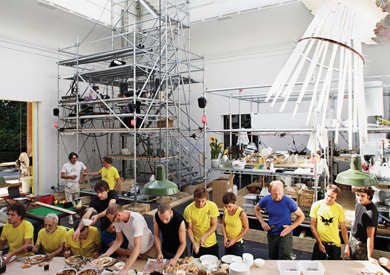 The Danish Pavilion followed curator Henrik Valeur's prompt: How can we improve people's living conditions without exhausting the very resources needed to sustain a better life? The display presents the sort of dramatic statistics that Rem Koolhaas first introduced with his Pearl River research almost a decade ago, alongside theoretical projects by teams of Danish architects and Chinese architecture schools. Their fantastical gestures—business centers that resemble picturesque mountains, a peaking infrastructure-laden mega-wall circling a city—betray the sense that the country is still perceived, by too many in the world (including the Chinese themselves) as a tabula rasa. Hungary had a quirkier approach to the topic of China as both a consequence and protagonist of globalization: Its pavilion was filled with artful installations made of cheap China-made toys: a canopy of chirping plastic penguins, a wall of plastic resin with repulsive furry toys imbedded within. The installation was part of a larger project, documented in a fine catalogue, investigating the impact of Chinese immigrants on the world's cities and of Chinese-made goods on life everywhere. It was one of the few projects that conveyed what I wish the Biennale accomplished more: how globalization and urbanization has affected people's lives. 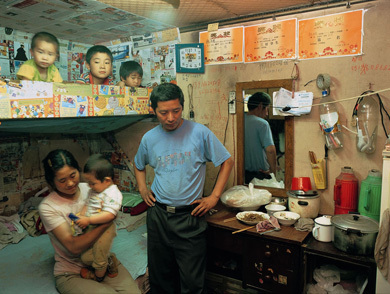 This was poignantly communicated in Hu Yang's Shanghai Living (2005), a photographic series displayed in the Italian Pavilion, showing a factory worker, shop-girl, office manager, and dozens of other Shanghai residents in their homes. Each is presented with a statement from the subject, personalizing the effects of the phenomena measured elsewhere in the Biennale. Hu Yang's images are on display in C on Cities, a special photography exhibition in the Italian Pavilion, curated by the London-based publication C International Photo Magazine. Issue 3 is dedicated to its Biennale presentation, and is available through www.ivorypress.com. Up to now I am satisfied with my life, and I like photographing and collecting western art works during my leisure time. I have pressures, mainly from competition within the circle and requirement from inside. I want to do everything I can to promote Shanghai's photographing industry. We are leading a hard life and eat battercakes, pickles and a glass of water for all three meals. When our kids want meat dishes, we cook them an egg. We work more than 15 hours a day if it doesn't rain. We want our kids to be educated and not to live like us. I will risk anything for our kids to go to university. My eldest son is excellent and wins prizes every semester. I suffer being teased by local ruffians. At the Hearst building on 57th Street, the trip up from street level on a side-skewed escalator embedded in a stepped glass waterfall feels a bit like scaling the sides of a pyramid. Reaching the mezzanine lobby of this old-new corporate headquarters is to experience a true sense of arrival, just as its architect Norman Foster surely intended. The Hearst building is the most significant of the new crop of Manhattan icon buildings because it changes the terms of engagement. Instead of making itself known by powerhousing its way into the skyline like the Time Warner Center, Foster's first skyscraper in the United States enlists restraint and sophisticated technologies—qualities so much harder to grasp than a snappy image—to endorse a corporate brand. But whether all the advanced environmental, structural, or social engineering is for real or for show remains unclear. The main lobby is a showstopper. Elevated three levels above the street, it is every bit as operatic—albeit with a sci-fi air—as the Aida-esque cast concrete original built by set-designer Joseph Urban and George P. Post in 1928, which has been preserved as a kind of orchestra pit from which the new skyscraper rises. Occupied by pharaonic phalanxes of 30-ton box columns and various mega-diagonals with artist Robert Long's six-story banner of mud art running up the core, this 35,000-square-foot space—which Foster calls the piazza—is rendered even more like a real town square since Urban's concrete walls have been stripped clean and furred out to look like the exteriors of, say, the walls of a Milanese bank building circa 1930. But instead of opening to the sky, the piazza is covered by a vast skylight. Tilting back in a cafe chair at Cafe 57 (aka the company canteen and the main occupant of the space), one stares right up at 36 stories of glass and steel muscle flexing its way to the skyline. Suddenly, the to-ing-and-fro-ing of people is reduced to an inconsequential shuffle, as soothing as the sound of the Jamie Carpenter–designed waterfall that has been computer programmed to mimic a babbling brook. Corporate confidence this suave is intimidating. That makes it all the more significant that most of the building's rave reviews have dwelled not on Foster's magnificently controlled stagecraft but on its environmental and structural features. It's especially unusual given the business of its client: Hearst is a media giant, the third largest magazine company in the country, with a stable of titles including Cosmopolitan, Harper's Bazaar, Seventeen, and Esquire. For an empire fixated on image to put good works before good looks is a watershed moment in corporate branding strategy. In fact, Hearst is so proud of all the green stuff going on in the building that it has emblazoned its LEED Gold medallion right between the revolving doors leading into the building. And kudos to them for the 75 percent of the year that air-conditioners will be using outside air; the reduction in electrical energy use that can be estimated to be the equivalent of 1,074 tons of CO2; and the 14,000-gallon reclamation tank in the basement that is at the ready to supply some 50 percent of the water needed for all the building's plantings. And so on. Not to diminish the building's very real accomplishments, but the United States is so far behind most European and Asian efforts when it comes to enacting sustainability measures that it's hard to get too excited about reducing electricity and water consumption. The building doesn't have nearly as many of the energy-saving strategies as Foster's Free University in Berlin and Swiss Re in London boast. In fact, its accomplishments as a green building are modest when compared to almost any other building by its own architect. It might rate well by local standards, but the truth is, every new skyscraper in New York should be LEED Gold–certified by now. As for the diagrid structure, which has been described variously as a jack-in-the-box, a French-market net bag, and a hydraulic scissor-lift, it is derring-do of a higher order. The diagrid started out as a device to stiffen the east facade, which was necessary because the architects pushed the service core off-center, toward the western edge of the site, up against a neighboring 50-story apartment building. 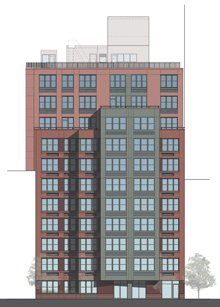 (They placed the core on that edge, reasoning that westward views would be blocked anyway by the apartment building.) But the diagrid looked so good, Foster went for the full wrap even though it creates floor plates that vary considerably in size, from 17,000 to 21,000 square feet. This is just another of the idiosyncrasies that a single corporate client can afford. At another point, the architects thought a cable rod running vertically through the building's corners might be necessary to steady any sway resulting from the 20-foot difference in floor-plate size at the extreme corners, but that became redundant once the longest beams were suspended from above rather than secured by a cantilever. 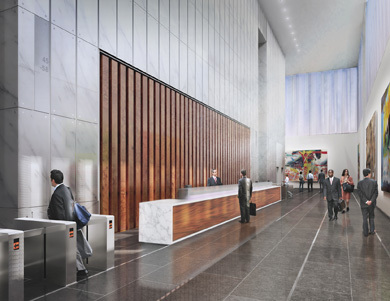 In a similarly productive collaboration between determined aesthetics and innovative engineering, the design team managed to come up with a way to make the lobby even more grandiose, in spite of structural necessities. (The space is already an impressive structural feat in that its skylight is the primary support for the old concrete shell of the Urban structure.) Foster was not going to let the opening between the modest ground-floor entrance and the spectacular mezzanine lobby look like some trap door from below. Instead, there is a gaping 80-foot-by-30-foot space through which the elevators rise, thanks to a specially devised ring beam that disperses the force thrust of all those mega-columns supporting the tower. Traditionally, the job of corporate icons has been two-fold: to show off institutional might and to instill employees with slavish devotion. 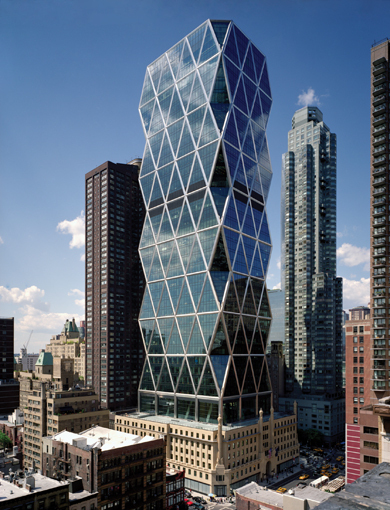 The Hearst building accomplishes the first of these tasks with impressive pizzazz. 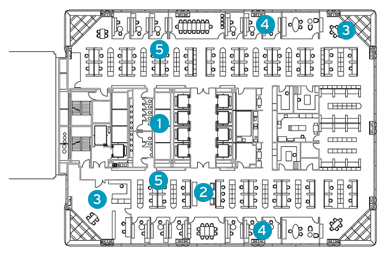 The office floors should please employees, too, even if views from some senior editorial offices are slashed right through with big fat braces. The plan is conspicuously open with cubicle walls that are lower than American Dilbert cells and higher than their Euro-equivalents. And all perimeter offices have glass walls allowing sunlight to flow in unimpeded. Still, there's an overall sameness, even with the glorious conference corners where unimpeded glass meets vertiginous views. They made me think of the good-old bad days when hierarchies were more visible, even aspirational. Here, there's no art department ghetto where the music blasts and the walls are tacked-up with messy collages. There's no editor-in-chief lair with furnishings better than the rest, inspiring ambitious underlings to plot their climb up the masthead. All that sunlight is well worth the loss of outdated modes of status reinforcement, right? But then deep in the heart of the building is the Good Housekeeping Institute. It is a strange and vital place where stacks of new products are piled around and row upon row of lab equipment sits at the ready to test everything from the latest washing machine from Miele to the next generation of Fruit Loops, all hoping for the coveted Seal of Approval. The Institute, with its messes and lab-coated technicians huddled at a counter sharing lunch, underscored the complete aesthetic control and good taste that practically smothers the rest of the building. Since the 1920s, the Institute has held luncheons in a special dining room that has received numerous U.S. presidents, including Ronald Reagan and Jimmy Carter, as well as Laura Bush and Hillary Clinton. Hearst executives decided to replicate the original dining room in the new 29th floor Institute—a Mount Vernon set piece, complete with black marble fireplace, sconces, rugs, and furnishings re-installed intact. Apparently, they think that our presidents are more comfortable in a colonial-style setting rather than in a space like the 46th-floor boardroom where two diagonal columns intersecting the northward view of Central Park etch a mighty V for victory. 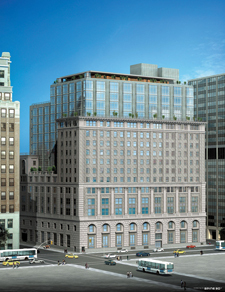 The new Hearst building is a welcome addition to the Manhattan horizon. It may not dominate the skyline but it certainly raises the bar for the next corporate brand with ambitions. Architect: Foster and Partners: Norman Foster, Brandon Haw, Mike Jelliffe, Michael Wurzel, Peter Han, David Nelson, Gerard Evenden, Bob Atwal, John Ball, Nick Baker, Una Barac, Morgan Flemming, Michaela Koster, Chris Lepine, Martina Meluzzi, Julius Streifeneder, Gonzalo Surroca. 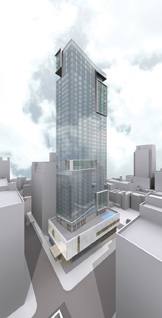 Associate architect: Adamson Associates; Tishman Speyer Properties, development manager. Engineers: Cantor Seinuk Group, structure; Flack & Kurtz, mechanical; VDA, vertical transportation. Consultants: George Sexton, lighting; Ira Beer, food service; Gensler, interiors. 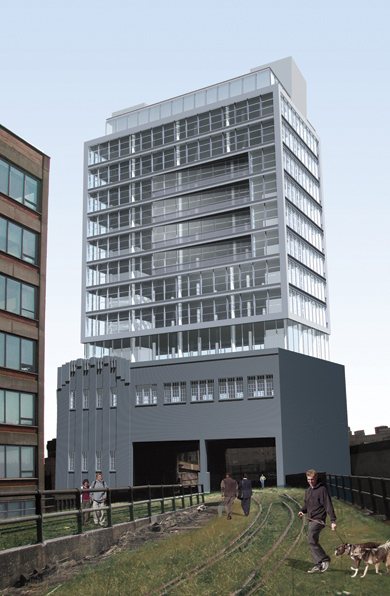 As developmenttand property valueearound the High Line heats up, planners and advocates try to ensure that the new elevated park isn't annexed as a city-maintained backyard for new condos. Alec Appelbaum looks at how the city's most interesting new park is balancing public accessibility with private development. 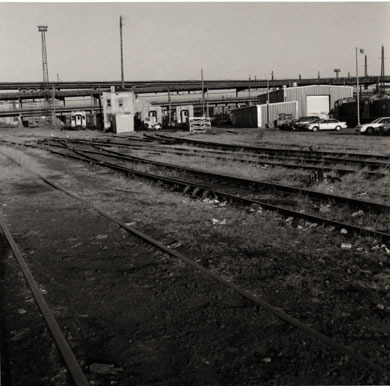 As a freight line, the High Line was designed to bring trains right up to the loading docks of the buildings it served; as a public park, it will bring people up to and even through those same buildings. Much of the High Line's strange beauty stems from its stark contrasts: It is a massive steel industrial relic that shelters an improbably delicate and accidental landscape. For many years, the old railroad trestle running above and through the buildings along Tenth Avenue seemed to be hidden in plain sight, its obsolescence rendering its bulk almost invisible. But since work began to transform it into New York's most anticipated new public space, the High Line has come into sharp focus, especially for developers and architects who want to build near this new amenity. 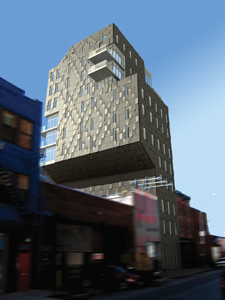 There was not always consensus on the High Line's future, of courseeas recently as 2002, Mayor Rudolph Giuliani ordered its demolitionnbut after the Department of City Planning (DCP) rezoned the surrounding area last year to allow condominium and hotel uses and the transfer of air rights within the new district, opposition faded. 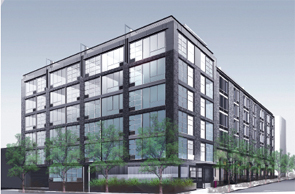 More than a dozen new residential projects are in the works, and others are sure to be announced as more parcels change hands. This mini-building boom has led to the latest of the High Line's contradictions: How can a public park seem open and accessible to all when it touches and even passes through privately held property? Everyone involved with the projecttits designers, architects Diller Scofidio + Renfro and landscape architecture firm Field Operations, champions Josh David and Robert Hammond of Friends of the High Line (FoHL), and not least of all, the DCPPis adamant that access is paramount. Another priority is to keep the High Line from feeling like a patio extension of adjacent buildings, which would destroy its appeal. To keep that from happening, the Parks Department has just released a set of guidelines to keep public and private in balance. The standards, which augment bulk requirements embodied in the 2005 rezoning, enforce three main ideas: Connections from new developments should appear distinct (taking the form, for example, of bridges or vestibules); they must be usable by the public; and their materials must not distract from the High Line itself. David stresses how harmonious the new private access guidelines are with FoHL's initial vision. The fact that the High Line weaves through the center of city blocks and connects to buildings is integral to its identity,, he said. It's not a street, yet we want this to be well-used and well-loved at all times of day by all kinds of people.. Philosophically, David suggests, it's more vital to keep the High Line merging with buildings the way it did when it carried trains than it is to pretty up those buildings. James Corner of Field Operations says the planners who wrote the guidelines share his reverence for the High Line's unique blend of industrial underpinnings and wild plants. Their co-presence is what makes the thing so powerful,, said Corner. And like David, City Planning Commissioner Amanda Burden, and Parks Commissioner Adrian Benepe, Corner guards against letting doors, awnings, and logos blunt the landscape's impact. The last thing we want is an elevated street with plazas,, he said. We want to avoid any permeable curtain wall that immediately joins the High Line; we want to retain the autonomous character of the High Line..
Part of what protects that character is its lack of access. Officials won't divulge any rules for spacing or capping connections, but they all stress plans to keep the links strategic,, in Corner's term. 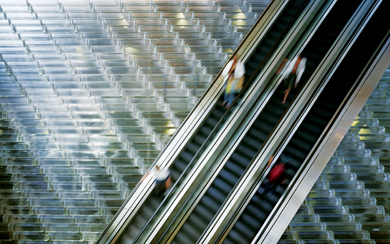 Diller Scofidio + Renfro designed staircases and lifts for the public every two blocks. Buildings will face strict scrutiny if they want to add a link on the path. We have to focus on how few access points can we get away with,, said Burden. Keeping [the original spacing of] 5.5 feet between the [vertical posts of the] rail fencing is essential,, she continued, and private space, caff or retail, has to be set back 15 feet.. Yet the flow into the park must feel active, Burden said. The worst thing would be blank doors.. This is a delicate balance in a hot real estate market. Since 2001, according to Jonathan Miller of appraisal firm Miller Samuel, property values in Chelsea have started catching up to the borough-wide average. The Meatpacking District's menagerie of restaurants and hotels has conditioned developers to amp up the glitz just south of the High Line's terminus at Gansevoort Street. How can you expect discretion once they get to the park? More easily than you might think. 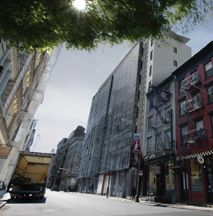 Miller guesses that proximity to the High Line alone makes buildings more valuable. You don't have to be an architecture enthusiast to appreciate that it's something different,, said Miller. 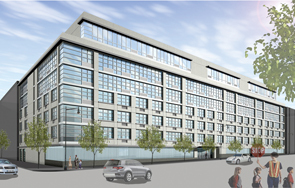 Morris Adjmi is designing a hotel for developers Charles Blaichman and Andrr Balazs at 450 West 14th Street, which bears the rare distinction of straddling the trestle. A diagonal moves through the building and we have two triangular spaces beside that,, said Adjmi. 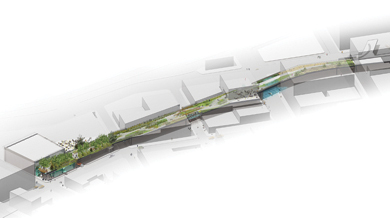 The idea is to feel like it's a seamless transition and the High Line informs the environment.. The plan involves a cube of glass over the structure to expose the park's changing colors. Later, Adjmi will decide whether a ramp or a staircase should reach the park. What's key, he says, is to make guests feel they have a head start on reaching a public destination. The High Line is such a unique space and [its] design taken to such a high level that accessibility to it will be like having a house on the beach.. 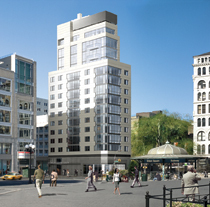 The Caledonia, a condominium at 450 West 17th Street designed by Handel Architects (top), and a hotel at 450 West 14th Street designed by Morris Adjmi Architects (middle) for hoteliers Charles Blaichman and Andrr Balazs have direct access to the elevated trestle. 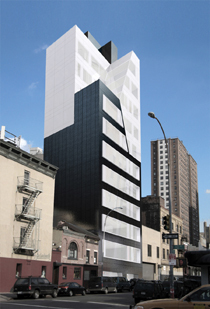 Meanwhile, Deborah Berke and her client Marianne Boesky chose not to connect her new gallery at 509 West 24th Street to the structure (bottom). 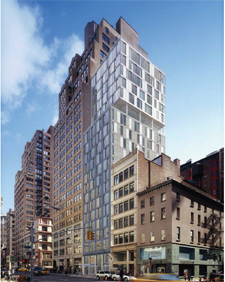 Roger Duffy, a partner at Skidmore, Owings and Merrill, is designing another key building: the new continued on page 20 playing the links continued from page 19 Dia Center for the Arts at the park's Gansevoort Street beginning. He aims to celebrate the High Line's role on the skyline rather than to offer users some exclusive vantage. 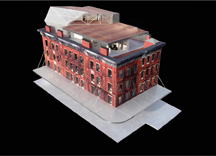 His plan places a sculpture by Dan Grahammoriginally installed at the Dia's 22nd Street locationnon the center's roof so that it appears to float beside the park when you approach it from the Meatpacking District. Let's say you come up the slow stair. At that moment you turn left and there's an entrance there with a piece of great art hovering; it is inviting and welcoming but doesn't overwhelm the High Line.. His grammar for the roof also defers to the iron trestle borders. On the roof we have clerestory lights clad in metal. We thought the metal could come down to the horizontal datum of the High Line..
Laura Raicovich, the deputy director of Dia, describes the museum's connection as a transition point from the multi-input experience of walking the High Line to the contemplative experience of looking at art. She, like Corner, stresses practicality and quiet. The High Line is the facade of the building,, she said. You can design an ego-less buildinggif one existsshere because simplicity is very important.. She says key inspiration came from Dia: Beacon, where the founding architect had shown the kind of practicality Corner admires. A lot of the key design cues come from what we feel has been successful at Dia Beacon,, she said. 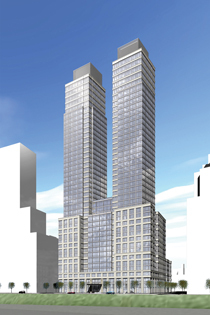 Robert A. M. Stern, who is designing a building with a connection point at 10th Avenue and 17th Street for Edison Properties, won't talk about his plans but does admit to a fondness for simplicity. He cited the former West Side Highway, which became an impromptu urban beach before it was demolished. Just being up above the city is wonderful,, said Stern. For him, the ideal connection would be restrained and the experience akin to the moment when a train emerges from Grand Central Terminallan awakening to daylight and industrial infrastructure, not a privileged view. But deciding how to manage connections involves controlling traffic as well as providing views, and the city will review proposals on a case-by-case basis. Said Corner, whose firm is preparing principles to supplement the Parks Department's guidelines, The High Line was built by engineers who were only concerned with logistics. We've tried to stay true to that, toooto avoid anything too aestheticized and try to keep things tough and real. I would advocate the same thing for these sorts of connections.. Parks Commissioner Benepe oversees these connections because the Mayor's Office designated the High Line as a city park in order to gain site control. And Benepe approaches the access design as a practical concern in attracting users to a park unlike any other. We want it to be a place where you can go on a cloudy day and be alone or go on a summer day and be there with thousands of people. 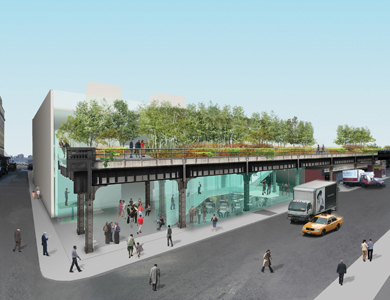 Our hope is that it will feel like a festival, minus the sausage vendors and tube socks..
Fortunately for Benepe, developers seem inclined to tie the value of connections to the High Line's foot traffic. The excitement of the High Line is that it's not managed,, said Michael Field, executive vice president of Edison Properties. Public spaces are always better when there are more people in them.. Negotiations over access from privately held property will remain trickyyCorner says he's seen some drawings that get a little too intimate for his comfort. Each developer must submit plans to the Art Commission. These negotiations, while sensitive, seem likely to remain as mysterious as the landscape they affect. One of the elements of keeping this process positive is not hashing out the day-to-day details,, said David. So it's not an area I'm going to go into.. David may not have that much cause for worry. Adjmi says his clients are considering a park-level screening room that would host public events. And Field is hardly alone in surmising that a popular High Line will feel much more special than a gated one. It seems the design guidelines for access resonate with architects who understand that a link to the High Line is a link to the beauty the city has when we enjoy it equally. 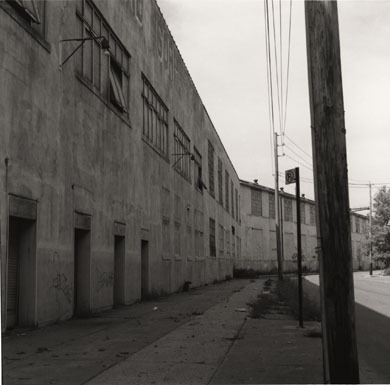 Alec Appelbaum writes about the urban environment. The long-awaited Brooklyn Bridge Park's maintenance will be funded by commercial and housing developments within its boundaries, which has some locals worried whether the trend toward private funding of public spaces has gone too far. Alex Ulam reports. After defeating a 1984 plan by the Port Authority to sell off the piers along the East River waterfront below the Brooklyn Heights Promenade, neighborhood groups began to advocate for a new park along the same site. Twenty years later, their efforts have begun to pay off: A 1.3 mile-long stretch of the East River waterfront from Atlantic Avenue to just north of the Manhattan Bridge is about to be developed as Brooklyn Bridge Park. New York State and New York City have committed $150 million to design and build the 85-acre park; construction is expected to begin next year. But for some Brooklyn residents, the current master plan, which was approved in January, looks more like a pastoral backdrop for luxury coops than an urban park: Almost 10 percent of the land has been set aside for commercial development within the site. The plan allows for five new buildings within the park's boundaries, the tallest of which could be 30 stories, and several preexisting structures will be converted into housing and commercial space. 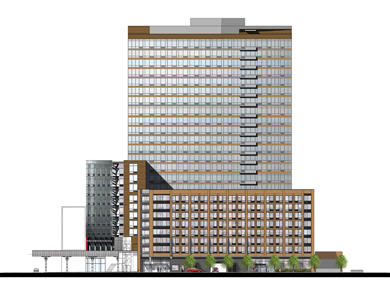 The bulk of this new development is clustered near the park's main entrances at Atlantic Avenue and at Fulton Street, where plans call for a 225-unit hotel and a residential complex. Brooklyn Bridge Park marks the latest stage in the growing involvement of the private sector in the financing of public spaces, especially along the waterfront, where building and maintaining a landscape is more expensive than in upland areas. Hudson River Park, for example, which is still under construction along Manhattan's West Side, is the first public park in the state that depends solely upon commercial entities within its boundaries to pay for its maintenance and operation costs. These parks also represent a new paradigm in that they are not being developed by parks agencies but rather by quasi-public entities headed by political appointees; in this case, by the Brooklyn Bridge Park Development Corporation (BBPDC). Brooklyn Bridge Park has expanded on this model by including housing. 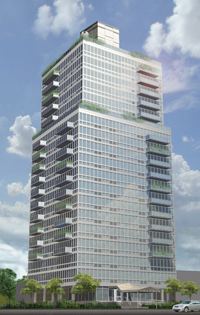 Through a financial arrangement called Payment in Lieu of Taxes (PILOT), the condo buildings slated for the park will, instead of paying property taxes to the city, directly pay for the park's maintenance and operations as well as capital maintenance, which in total is estimated will cost $15.2 million annually. 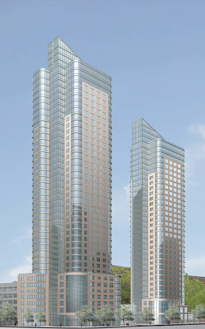 Developers have not been chosen for the new development parcels. According to Deborah Wetzel, a spokesperson for the Empire State Development Corporation (ESDC), the BBPDC's parent organization, Requests For Proposals will be issued this fall. In addition to the new developments, legislation passed in the State Assembly in June made it possible for an existing building within the site, at 360 Furman Street, to be removed from city tax rolls and incorporated into the park. 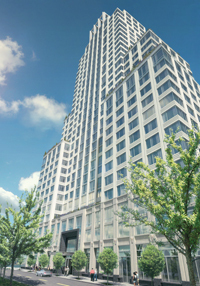 The developer of 360 Furman Street is Robert Levine, who bought the former Jehovah's Witnesses book plant for a reported $205 million several years ago. Through a spokesperson, Levine refused requests to be interviewed for this article. But in a May 2006 article in The Real Deal, Levine was interviewed about the funding of Brooklyn Bridge Park. The municipality is no longer able to support these things,, he said. The only way it can work is with private funds..
Not everyone believes that it has to be that way: In May, the Brooklyn Bridge Park Defense Fund, a group formed to oppose the BBPDC's plan, filed a lawsuit in Brooklyn Supreme Court against the ESDC seeking to remove the approximately 1,200 units of luxury housing from the park. The lawsuit charges the ESDC with violating state laws, which they say prohibits public parkland from being used for non-park uses. The suit also claims that the plan violates a 2002 agreement between the city and the state, which restricts development of the park to activities consistent with an earlier masterplan developed at the behest of the Brooklyn Bridge Park Local Development Corporation (BBPLDC), comprised of representatives from community organizations and local elected officials, and formed in 1998. For the Defense Fund, the planned residential development not only compromises the current design, but also has potential create conflicts between park users and residents. Our goal is to get a real park that people can use without privatizing it for housing,, said the president of the Defense Fund, Judi Francis. Citing the litigation, Wetzel declined requests for interviews with ESDC officials. But in a written statement, she maintained that design guidelines for the new buildings, being developed by Robert A. M. Stern Architects, will protect the park's public aspect. The guidelines will ensure that public benefit from development is maximized, including requiring high-quality architecture and buildings that contribute positively to the life and vibrancy of the adjacent parkland and the surrounding neighborhoods,, the statement reads. 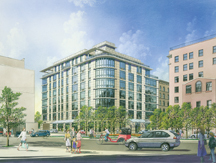 Noting the park's relatively remote location from residential neighborhoods, the park's landscape architect Michael Van Valkenburgh says that the hotel and housing will enhance the quality of the park user's experience by establishing a critical mass of people in the park at all times. Who the hell would go to this park in the winter and at night if you didn't have activity down there?? he asked. From Atlantic Avenue the walk to the Brooklyn Bridge on Furman Street, which is very forlorn, is about 20 minutes. You go down there today and you won't pass a single personnwhere in New York can you walk for 20 minutes and not see anybody?? Opponents of the plan contend that the maintenance budget is unrealistic and that the park has been over-designed. They have jacked up the maintenance costs in order to justify building all of these buildings,, said Bronson Binger, a former assistant commissioner for the New York City Parks Department, who filed an affidavit on behalf of the Defense Fund's lawsuit. My main problem is the $15.2 million maintenance costs per year for about 85 acres of park,, he said. Compare that to $23 million for Central Park's 840 acres. Clearly, there are things in there that shouldn't be.. 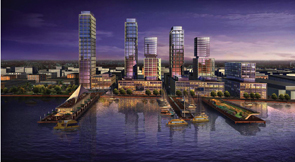 But Matthew Urbanski, a principal with Michael Van Valkenburgh Associates, counters that the complications of maintaining the piers and a waterfront landscape justify the relatively high maintenance costs. We have massive piers three times the size of the size of the ones in Hudson River Park built on wooden piles,, he said, adding, We have to jacket the piles with plastic or concrete and then maintain them from year to year..
At the root of the controversy over Brooklyn Bridge Park are two competing visions contained within two separate plans: one is the current Van Valkenburgh plan, the other is the 2000 masterplan, commissioned by the BBPLDC from Urban Strategies (Van Valkenburgh was a subcontractor on the plan). The BBPLDC held a year's worth of public meetings to develop the park's program. Several years later, the BBPDC was founded and conducted a financial analysis of the Urban Strategies plan. State officials determined it was not financially feasible, and hired Van Valkenburgh to devise a second masterplan. The Urban Strategies plan featured a hodgepodge design with recreational facilities interspersed throughout the whole park. Its maintenance and operations budget was to be financed primarily through recreationally oriented commercial development as well as stores within the park. 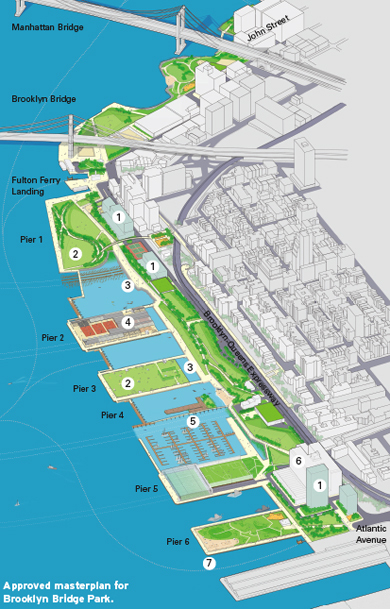 In contrast, the later Van Valkenburgh plan concentrates most of the active recreational activities on the piers. The upland areas are reserved primarily for passive recreational activities, housing and retail. Roy Sloane, a former board member of the BBPLDC, is concerned that the interests of many neighboring communities, which have been agitating for more recreational facilities, are not adequately served by the Van Valkenburgh plan. The state threw out the community-based plan,, said Sloane. The recreational center, which we needed, was removed and replaced with 1,200 units of housing..
Urbanski argues that the current plan actually includes more opportunities for active recreation, and cites a pier devoted to basketball and handball courts and large protected areas set aside for kayaking. 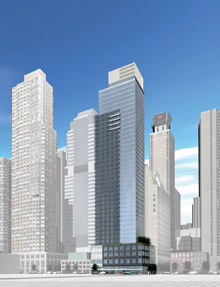 Furthermore, in Urbanski's view, many elements of the 2000 plan, such as its siting of large buildings on the park's piers, would not have worked structurally. The old plan made assumptions that were terribly erroneous,, he said, adding that studies show that the 2000 master plan's maintenance budget was grossly inadequate. Binger, however, maintains that the civic qualities of the park will inevitably be compromised by the current plan: When parkland abuts private land, conflicts inevitably happen.. Van Valkenburgh has responded that his design ensures that public aspect of the park will be preserved. The housing and hotel parcels back up to public streets that are not in the park,, he noted. We have used a series of devices like landforms to create discrete but precise limits between the development parcels and the park..
A case is scheduled for a court hearing on August 2. Alex Ulam is a manhattan-based writer who focuses on environmentalism and urbanism.